With the ever increasing requirement of reaching out to the customer in almost every industry, the role of the salesman has become all the more important. Certified Sales Managers are one of the highest paid and most sought after professionals today. The importance of selling and marketing skills is set to become far more important in the times to come as product marketing and delivery become more complex with increased time and cost constraints. Sales Managers allocate the sales territories, fix goals and launch training programs for the sales representatives. 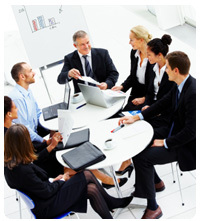 They motivate and guide the sales representatives to improve the sales performance. You will master the art of sales and marketing by the end of these courses. You will have almost all of the tools you'll need to effectively motivate and manage sales and marketing teams. ExpertRating is a trusted name in online testing and certification with over 200,000 certified professionals in over 60 countries in more than 200 skill areas. You can learn how to deliver superior sales-team results from sales management veterans. These exciting six-week online courses talk in detail about the sales and marketing management's roles and responsibilities. The rest of the journey in these online courses provides you valuable tips, techniques and strategies for success and reinforces how critical planning is to successful sales management. You will learn how to prepare and lead better sales meetings and how to resolve team conflict. You'll also learn how to develop sales plans and budgets, recruit and interview new sales professionals, and set team goals and objectives. Finally, you'll have mastered the art of sales and marketing training. At the end of these courses, you will have almost all of the tools you'll need to effectively motivate and manage sales and marketing teams. The ExperRating Sales & Marketing courses can further enhance your resume and help you understand the skills and knowledge required to be a successful Sales Manager.